Here I’ll be giving details about the beers I intend to brew, all the batches will be listed here. I have subcategories Ales and Lagers (I haven’t attempted any yet) for those of you that just want to read about a specific kind of beer. 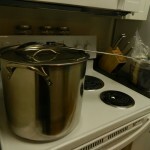 Two days ago I brewed a batch of Hefeweizen beer. This is a traditional beer from Belgian origins. It smelled great while on the stove top and this was actually the first brew that I attempted to record and talk about. I have the footage on my computer but I need to finish editing it together and complete the voice over. Either way, the beer went well, its fermenting now. The kit had only dried malt extract (as opposed to liquid extract or a combination), but a LOT of it. The process was similar to the Nut Brown Ale, in that there were no special directions. 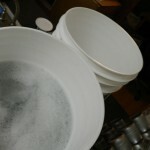 Once the grain was added to the water I brought it to 165F then removed the cloth bag. Then I added the dried extract and returned it to heat. Finally the boil lasted a total of one hour with the first batch of hop pellets going in at the start, the irish moss tablet in the final 15 minutes, and the aroma hops thrown in at the end as I removed it from heat. I cooled it in an ice bath and have it fermenting now. 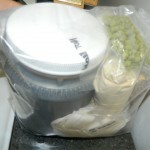 For my first batch I decided to go with a beer kit from my local brew store, the Oak Barrel Brew Store in Berkeley. The staff was fantastic and super helpful. They helped me find all the supplies I didn’t have such as an additional carboy and air lock (for those of you that don’t know, a carboy is a fancy word for the glass container in which the fermentation takes place). It was a fun experience and they even let me grind my grains on site and I got to heat seal the bag again, a neat experience although basic. I got home and got started on the sanitization. While boiling the smell was intensely sweet and smelled mildly bitter because of the hops. The malt smell was overwhelming as they gave me a liquid and dry extract in which to work with. I got done with the batch around 4:00am due to starting the actual boiling process late at night. 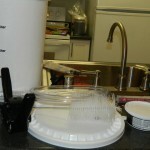 I really enjoyed the brew and I saw activity from the yeast the following day from the airlock bubbles. I am worried however that the temperature fluctuations in my apartment could have killed my yeast or will result in the project being jeopardized.